A Few Things We Ought To Trust: Waze, 6-Irons & Our Investment Portfolios | MacroView Investment Management, LLC. What was the last situation where you made an emotional decision only to regret it almost immediately? Did you trust your gut on a “shortcut” and get stuck in traffic instead of just listening to Waze? Did you hit your driver and try to carry the hazard instead of laying-up with a 6-iron? Did you really go into Target convinced you’d spend less than $100 this time? Well, we’re human beings and that’s what we do – we make emotional, irrational decisions from time to time. Unfortunately, our irrationality isn’t contained to life’s most trivial of circumstances like those above. One area where this tendency shows up all too often is in our world of investments and the stock market’s recent gyrations are the latest valuable lesson on why avoiding irrational decisions is key to sustaining wealth and mitigating risk over the long haul. To start, let’s rewind to September 2018.The S&P 500 reached an all-time closing high of 2930.75 on September 20, 2018. At the time of that closing high, the S&P 500 had gained 11.2% to date in 2018, and US equities appeared headed for another banner year. Economists and experts touted the positive effects of tax legislation and swelling corporate earnings, culminating in renewed investor confidence in the US economy. Equity markets did not tell the same story for the remainder of 2018. The S&P 500 tumbled 14% through the end of the year after peaking on September 20. Several major market indices, both domestic and international, entered bear market territory by losing over 20% from previous peaks. As always, investors tried to gain insight into the reasoning behind the volatility, whether it be recession talks, a hawkish Federal Reserve or rising trade tensions with China. More importantly, however, investors and advisors faced the decision of how to react to the violent market swings. Do I sell out? Do I buy more? What if this is finally the big drop everyone has been talking about? Should I try to time the market? Controlling one’s behavior during a market swoon is an important yet challenging endeavor. No one likes seeing losses in their account, especially of this magnitude. For example, a 7-day stretch in December 2018 saw the S&P 500 fall over 1.5% on 6 out of the 7 days. Investors often forget about previous gains when the losses come so swiftly and abruptly. However, it is for that same reason that selling out often ends up being the wrong decision. 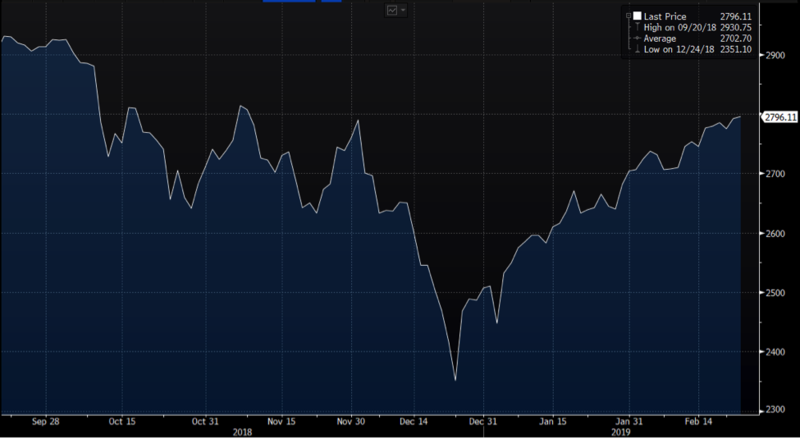 All in all, the S&P 500 sits about 4.2% from its all-time highs as of the close on February 25 after this drop and recovery (Note: After a 20% decline, the S&P would need to recover 25% in order to return to even). Obviously, in hindsight it’s easy to say investors should not have sold out of equities in December. However, we believe there is a more important lesson here. Specifically, it involves how investors view their equity allocation when constructing their overall portfolio. We believe that investors who have a significant portion allocated to equities should focus on the long game and play the odds. Historically, equity markets tend to rise and investing is a slow process that is designed to build wealth over time. In fact, since 1970 the S&P 500 has never experienced a negative total return over ANY 15-year period. That doesn’t necessarily mean that equities rise every day. In fact, in the same time frame, the S&P 500 has declined 46% of days. Thus, playing the odds may mean sitting on your hands as account values decline or even employing a dollar cost averaging strategy to help avoid stressful decision-making along the way. During times of market volatility, investors begin checking their account more often, wrestling with the decision about what to do as their accounts decline. Typically, the more frequently we look at our portfolios, the more likely we are to see losses and therefore, that feeling of needing to do something increases as we lose patience. Trying to determine the best time to sell and subsequently buy back in is extremely risky and often unfruitful, because it involves making two correct choices with ample precision. If market swoons force an investor to take action and change their portfolio, then their allocation was not correct to begin with. However, investors with proper allocations, established time horizons and discipline in their investing program can manage these market corrections knowing they are in the best position to achieve their goals as time goes on and markets recover. Over the last 5 months, equity markets experienced both rapid declines and sharp increases with very little overall change. We believe now is a great time to reevaluate your portfolio positioning if you felt the need to make substantial changes at any point during the volatility.